Chiles roasted over an open flame, or in the oven, impart a delicious smoky, chipotle flavor to salsas or any dish that uses chiles. 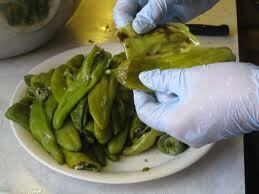 This preparation is used for peppers used in chile rellenos and countless other Mexican food favorites. Here's an important warning when handling chiles: Wear gloves when working with hot chile peppers. This is no time to be macho. Never touch your eyes when working with chiles, fresh or dried. If you are not a glove person, make sure that you wash your hands very well with soap when you're done. Alternately you may want to coat your hands with a small amount of cooking oil before you handle chiles. This prevents some of the oils from adhering to your skin. Once your chile chores are completed wash your hands well with warm soapy water. This method works well, especially in the RV kitchen, for roasting a small quantity of chile peppers. You may want to use a long handled cooking fork with a handle made with a non heat-conducting material. Pierce the pepper with the fork and hold the pepper over a gas flame (or grill flame), about 4" from the heat source. Keep turning the pepper until it is evenly charred on all sides. 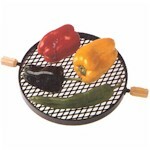 For larger quantity of chiles you can use a stove-top grill such as the one shown here. This fits over a gas or electric burner. Sit the chiles on top and turn occasionally to allow even charring. Use tongs to keep the vegetables turned for even charring. 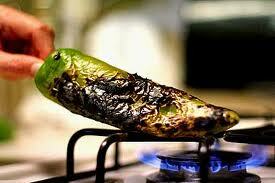 This can also be done on a BBQ grill if you can get the chiles very close to the coals. Preheat your oven to 450°F or broil (232°C.) Spread the peppers evenly on a cookie sheet, in a single layer. Roast the peppers for about 4-5 minutes until the skins blister. Watch carefully so they do not burn but the skins will turn black. The secret to easily peeling regardless of the method you use? Place the roasted peppers in a plastic bag and seal the bag. 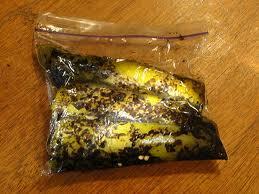 Allow the chile peppers to 'sweat' in the plastic bag* for about 10 to 15 minutes. When you remove them from the bag they will be easy to peel. Rinse the peppers under cool running water (wear gloves!). Peel the chile, remove and discard the skin, seeds, and the veins. It's a messy job but somebody has to do it. Preferably get hubby to help then claim you only have one pair of gloves and you'll be glad to let him do the honors. Hey, sometimes it works. It may be desirable to have a small amount of the charred skin remain, depending on the dish. This can be a flavorful addition to fresh salsa. *You may also use a paper bag but I find the peppers sweat more in plastic. You can even put your hand right in the bag and peel the chiles leaving the skins inside the bag. Another possibility: You can also use this method for roasting bell peppers (use various colors) and marinating them in a vinagrette. This makes a great Italian style salad or condiment.